The State Academic Bolshoi Theatre named after Alisher Navoi is the only Bolshoi Theatre in the whole territory of Central and South-East Asia. The Theatre's history begins from 1929, when amateurs from the concert-ethnographic ensemble under the direction of M. Kari-Yakubov organized a theatrical. In 1939 it was re-named to the State Uzbek Opera and Ballet Theatre and in March 1948 it merged with the Russian Theatre and was named as the State Opera and Ballet Theatre named after Alisher Navoi. Later on, in 1959 the Theatre was awarded an academic status and in 1966, the status of a Bolshoi Theatre. The building of the Theatre was erected in 1947 under project of the architect A.V. Tshusev. 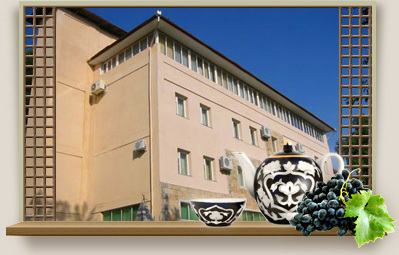 The decoration of the building was performed with a participation of T. Arslankulov, A. Boltaev, K. Jamolov, S. Narkuziev, Usta Shirin Muradov and others. The facade and interior finishing employed Uzbek traditional motifs of monumental architecture. The theatre architecture represents a search of the synthesis of national art of building and methods of classic European compositions: the portal part is empathized with deep lancet arches; the pattern of the lateral galleries follows the motif of the main portal. The audience hall, numerous lounges, stairways are decorated with ganj and marble carving. The ganj panel picture used traditional motifs of architectural schools of Tashkent, Fergana, Bukhara, Khorezm and Samarkand.